For as long as humans have been fascinated with precious gems, they have assigned special significance to them. The 12 zodiac gems formed the basis of the modern, Western birthstone list. The national trade association Jewelers of America established a list of birthstones in 1912 that remains the standard today. Alternative lists also exist, and who’s to say you can’t choose your own? Garnet has been the birthstone for January since the 15th century, at least. With a Mohs hardness of 6.5 to 7.5, it can be faceted into beautiful gemstones that wear well in jewelry. Since the term “garnet” actually refers to a group of nesosilicate gems, those born in this month can choose from a rainbow of colors. 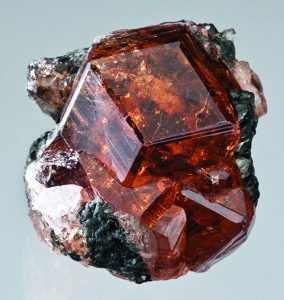 The most common members are red almandine, an iron-aluminum silicate; red pyrope, a magnesium aluminum silicate; orange-yellow spessartine, a manganese aluminum silicate; the yellow or green varieties of andradite, a calcium-iron silicate; predominately green grossular, a calcium-aluminum silicate; and rare, bright-green uvarovite, a calcium chromium silicate. From the 15th century to the present, amethyst has been the preferred birthstone for February. Amethyst belongs to a mineral family that can compete with garnet for diversity of color: quartz. Pure quartz is colorless, as exemplified by Herkimer diamonds. The causes of amethyst’s shades of pale violet to rich purple are radiation and the inclusion of iron impurities and trace elements. As a rule, amethyst crystals are short and stubby, and occur in large numbers, often filling a large vug a hollow petrified tree section, or lining the inside of a geode. Fine crystals that are large enough to produce a faceted gem of over 20 carats are rare. The current choice of a birthstone for March is aquamarine. Aquamarine is a variety of beryl (Mohs 7.5-8). Its name was derived from the fact that the beautiful, transparent, blue-green coloration of the gem resembles that of seawater. It can be found in translucent to transparent crystals that form in the hexagonal system. The six-sided crystals are often striated lengthwise. Aquamarine develops in metamorphic rocks and, more often, in pegmatites. Before 1900, a person with an April birthday had two choices of birthstone: diamond or sapphire. During the 20th century, however, diamond became the preferred stone. Diamond, a mineral consisting of pure carbon, heads the list of all gemstones for its beauty and hardness. Representing No. 10 on the Mohs Scale of Hardness, it is resistant to scratching, and therefore is an ideal gem to set in rings. Its hardness results from the arrangement of its atoms in cubes. All diamonds have slightly rounded faces, and they’re so smooth they feel greasy to the touch. They can be colorless and water clear to blue, pink, yellow, brown, green or black, and transparent or translucent. They shine with an adamantine luster when held to the light. There were two choices for May birthstones for several hundred years: emerald and agate. The popularity of agate seems to have waned at the turn of the 20th century, so emerald is now the favorite. It’s the green member of the beryl family of gemstones. The color varies from bright green to pale green and, sometimes, darker shades of blue-green. Fine emeralds have a velvety surface appearance and, in the better stones, an even distribution of color. One bad trait of emerald is a tendency to have inclusions. As a matter of fact, it’s rare to find an emerald without some slight imperfection. This in no way deters from the beauty of this gemstone, though. It can also one way of determining whether an emerald is a simulated gem or the real thing, as manmade stones have no imperfections whatsoever. The contemporary choices for June are pearl, moonstone and alexandrite. Of course, pearl is the organic product of marine bivalves, and not a mineral. Moonstone is a variety of feldspar that shows adularescence, or schiller, an optical effect that produces a milky luster with a bluish tinge that appears to move across the stone when it is tilted. The phenomenon is named after the feldspar variety adularia. Alexandrite is a color-change variety of chrysoberyl (beryllium aluminum oxide). This is a very rare and expensive gemstone. It has a hardness of 8.5, and its crystals are either tabular or prismatic. The distinction between alexandrite and chrysoberyl is simply color. A strange characteristic of alexandrite is that it is red, purple or violet when held under artificial light, but in daylight it looks green. Ruby is the standard birthstone for the month of July. It is a corundum (aluminum oxide) gem that gets its color from the presence of chromium in its structure. An exceptionally hard mineral, corundum illustrates the hardness of 9 on the Mohs scale. “Pigeon-blood” red is the preferred color for rubies, though they also occur in lighter shades, including pink. All other colors of corundum are called sapphires. Ruby exhibits all the desirable properties of a jewelry stone: beauty, durability, optical properties, and rarity. Some rubies display a star or asterism when fashioned into a cabochon. This effect is caused by the reflection of light from numerous inclusions of minute, needlelike crystals of rutile. 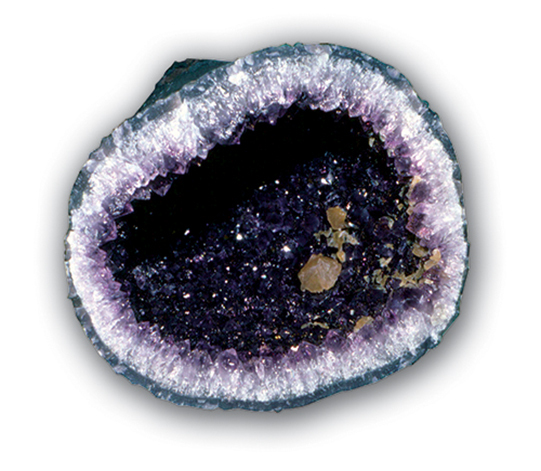 Corundum crystallizes in the hexagonal system with a tabular-barrel-shaped habit. Current birthstones for August are peridot, the gem-quality form of olivine, and spinel. Olivine makes up a large portion of the earth’s mantle. Rocks containing olivine have been brought to the surface by volcanic action and actually blown out in the form of volcanic bombs. Masses of olivine have been found in meteorites, and the Apollo astronauts brought basaltic rocks back from the moon that contained olivine. 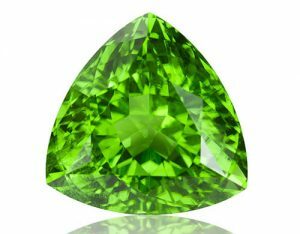 A popular jewelry stone, peridot has a hardness of 6.5-7 and can be transparent or translucent, with a vitreous luster. Its color shades from deep green to apple green, yellow-green or olive. It’s most often found in granular nodules, forming short, prismatic crystals in the orthorhombic system. Spinel is the gem-quality member of the larger spinel group. Its hardness (Mohs 7.5-8.0) makes it ideal for jewelry use. Its spectrum of colors includes red, pink, purple, blue and lavender. In times past, red spinel was often mistaken for ruby. 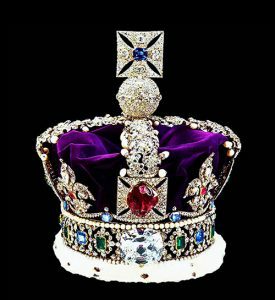 A notable example is the Black Prince’s Ruby, set in the royal crown of England. The birthstone for September is sapphire. This term refers to any corundum (aluminum oxide) gem that has any color other than red (ruby). Sapphires may be colorless, blue, green, yellow, orange, brown, pink, purple, gray, black, or multicolor. At Mohs 9, its hardness is second only to that of diamond. Heat treatment is sometimes used to give natural blue sapphires a deeper, more pleasing color. Natural star sapphires, which display the optical phenomenon of asterism, are very rare. Two options for October are opal and tourmaline. Opal is a magnificent gemstone with a quality that never ceases to amaze anyone who looks at it: play of color, or “fire”, in all colors of the spectrum. Spaces between the tiny spherules of silica that make up the gem diffract light into its spectral colors. Red, yellow, green and blue, in strong to pastel shades, flash from the stone when it is tilted. Opal occurs in common and precious types. Common opal does not display any reflective fire. It may have a honey-yellow, brown, gray or colorless body color that is milky and opaque. Opal (Mohs 5-6) is not a very hard gemstone. Tourmaline, a silicate of boron, has a complicated chemical composition, in which a number of elements, including calcium, iron, sodium and aluminum, may combine. It has a Mohs hardness of 7-7.5. It belongs to the trigonal crystal system, and its habit is hemimorphic (a crystal having two ends of an axes unlike in their planes). Due to the coloration of the individual stones, tourmaline has several names, including schorl (black), rubellite (red), indicolite (blue), and dravite (brown). Tricolor crystals are common. The popular watermelon variety has an outer layer of green around a red core. tend to think of topaz, a silicate mineral with aluminum and fluorine, as a yellow stone, but heat-treating and color-enhancing adaptations have made blue the predominant color on the market. It is an allochromatic mineral, which means its color is caused by internal defects in the crystal, and has a Mohs hardness of 8. Citrine is the golden member of the quartz family (silicon dioxide). Though quartz in its many forms is one of the most abundant minerals on earth, fine, gem-grade crystals are not that common. Citrine is affordable and, when faceted, rivals more expensive gemstones in beauty. There are three birthstones for December: turquoise, blue zircon, and tanzanite. Turquoise (hydrated copper aluminum phosphate) is an opaque, blue to green, massive gem material. It has a relatively low hardness of Mohs 5-6, so care must be taken with turquoise jewelry. The rarest and most valuable variety is robin’s-egg blue with black “spiderweb” veins of limonite. Fake turquoise, consisting of dyed howlite or magnesite, is common. Buyer beware. Zircon (zirconium silicate) can be blue, black, red, brown, green, yellow, smoky, or water clear. It has an adamantine luster much like that of a diamond, and it is often misidentified as such. Tanzanite, the blue/purple variety of zoisite (basic calcium aluminum silicate), is a recently-introduced alternative for December. Tanzanite crystals in shades of yellow to brown, green, pink, gray or blue are often heat treated to produce a gemstone that is a beautiful and permanent blue.